When life gives you egg whites, make meringues. Really. This is not Super Advanced Foodie Work. These taste like hot chocolate. Actually, like that little layer of foam on top of warm, milky hot chocolate. Note: Don’t panic if your ingredients don’t match this perfectly. I didn’t have cream of tartar, and I had powdered sugar instead of superfine. It still worked, and they were delicious and airily crispy. They might not have had The Perfect Meringue texture, but I loved them. 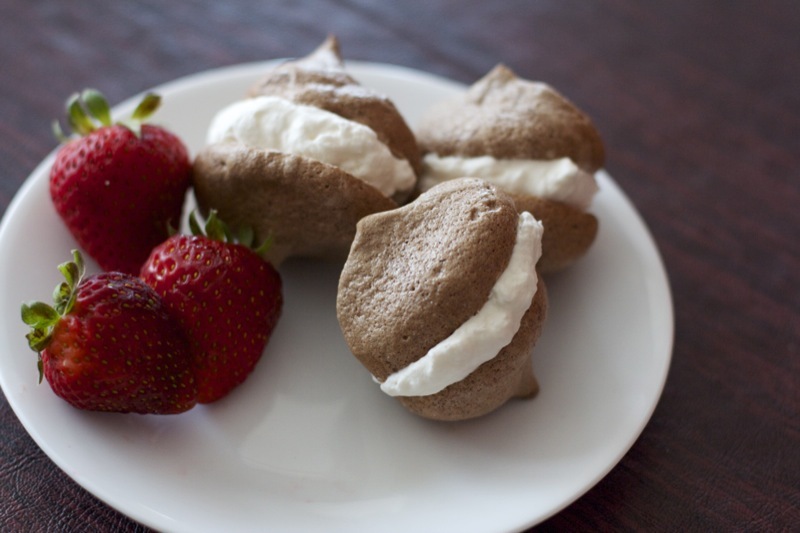 Life and meringues can continue without perfection. Prep work: Preheat oven to 200F. Sift 1/4 of the sugar with the cocoa powder. Put some parchment paper on a big sheet pan, and evenly sift powdered sugar on top. Beating: Using a stand mixer or hand-held beater, whip egg whites until they’re at stiff peak stage. (When you pick up the mixer, the point holds its shape). Add the non-chocolate sugar (1/4 cup) around the edges and beat until the egg whites are glossy. You’ll see them get kind of a sheen to them. Folding: Fold in the 1/4 cup sugar + chocolate gently. It doesn’t have to be perfectly even – don’t fold it so hard that you mush the air out of the whites…(now browns). Uhh..Plopping? Get a big gallon size plastic zip-top bag. fold the top part down, as if you were about to turn it inside out. Scoop the egg whites into it very gently. (side note: I always find myself making a funny face when I scoop something into something else.) Cut the corner/tip of the bag and just start squeezing little clouds onto the sugared parchment paper. They will not expand, so you don’t have to worry about spacing them too far apart. 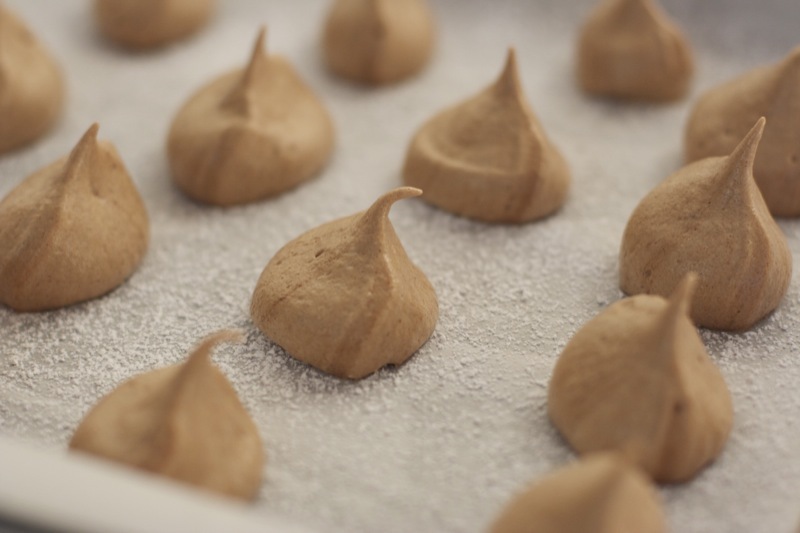 Baking: MB’s recipe says to bake – it’s really more drying out – 1-inch meringues for 2 hours at 200F, or until they’re hard. My meringues were on the large side, so I left them for about 5 hours. They’re ready when they easily pop off of the paper. Eat one. If it’s not crispy enough, leave it in your warm oven for another hour (this is especially great if you have a baking stone in there to retain the heat). Storage: Let these cool completely before trying to wrap them up. Put them in an airtight container. I think they’ll keep just fine on the counter since there is no dairy in them, but I keep them in the fridge and bring them to room temp before eating. For the ones I didn’t eat straight off the sheet, I sandwiched around some vanilla whipped cream. So. Cute. I was intimidated, too, but I thought – “Hey, might as well try them.” They really turned out well! I don’t think the egg whites have to be perfect. I don’t know if I got the authentic meringue texture when I made these, but they sure were crispy and airy and delicious. Try it; I know you can make these!